What I find so fascinating about hanging out with hardened atheist folks is that they love to blame God for pretty much everything they don’t like. I suppose there’s an irony here, since atheism is defined as believing there is no God. But I suspect that most atheist people make charges like what you see in this graphic because they’re angry with people who DO believe in God. Consider this: According to Oxfam Canada, there is enough food to feed everyone. In fact, the organization says the world produces 17 per cent more food per person today than 30 years ago. So what’s the problem? It’s certainly not God. It’s corrupt governments, greedy big business, rich people who don’t care enough about the world’s problem to do anything and poor people who accept their lot in life without any fight. In other words, the problem is humanity. Ok, you think. But why hasn’t God done an end-run around people and fixed the problem on His own? First, He IS doing something about it, through organizations like Oxfam, Samaritan’s Purse, World Vision, Feed The Children and dozens more. This leads directly to my second point: thousands of years of evidence makes it clear that God prefers to work through people than on His own. Given our very, VERY imperfect nature, many folks may question this approach (count me among them), but it’s still God’s way and I respect it. And that leads to my third point: since God is working through us to tackle the problem of hunger, what are YOU doing to make yourself available to Him? What organizations are you supporting? How are you thinking about the ways you spend your income? The vacations you go on? The graphic is making another point – rejecting the power of prayer. I’ve tackled that issue elsewhere on Frank’s Cottage (http://wp.me/p2wzRb-9a), so all I’ll write about that here is this: I’m going to continue to be thankful to God for all He’s given me, including the Gift of Jesus Christ (whom serious Christians believe is His Son). And I’m going to continue to ask Him to use me in the work He’s doing to change the hearts and minds of people. Now what are YOU going to do? Post your thoughts below and let’s have a conversation. Please understand that none of these memes are “blaming God” for anything. Their intent is to illustrate a perceived hypocrisy in religious dogma. There’s some truth to that. But you need to ask WHY they are angry with people who DO believe in God. Have you made an effort to understand this? Could you do a post (maybe you already have) on the subject of why atheists are angry? I guess you’re reading this meme differently than me and that’s certainly your right. As for your second point, Frank’s Cottage was not created to explain whatever issues atheist people might have. I’m sure there are all kinds of websites that provide such explanations. As Christians, we are to allow God to work through us and follow Christ’s examples to “feed His sheep.” You have brought up such a thoughtful point about where and how we spend our incomes. There is no reason that the vast majority cannot dig deep and find the necessary resources to share with others. And, you are so right – it’s our fallen humanity which is to blame for us falling short of lives of perfect service. Wonderful post, Frank! I’m definitely sharing on Facebook and Twitter. “It’s certainly not God. It’s corrupt governments, greedy big business, rich people who don’t care enough about the world’s problem to do anything and poor…” I agree completely with this. I live in a country where the rich and those in government care more about how much they corner to themselves than the good of fellow citizens. I find this very interesting, especially the part that places the lack of food squarely on the shoulders of humanity itself; because it applies directly to me, my neighbour and country. Yet you feel spiritually moved to make a scathing judgement on atheists and atheism yet when one patiently explains ( above) why your comment in fallacious you hand wave it away? And considering how much you use the phrase …. serious Christians you don’t think this is in any way hypocritical? Or maybe it is representative of just how hypocritical Christians actually are – based on your behaviour, it certainly seems so, Frank. Why aren’t you at least a little ashamed of your behaviour? You’re welcome to your opinion. In my view, this is anything BUT a “scathing judgement on atheists”. In fact, after the first two paragraphs, atheists aren’t even mentioned. Could you please quote a hardened atheist that would illustrate your statement above? Thanks for your comment. I’ve spent considerable time in Google+ atheism communities and have been surprised by how many posts & memes have directed anger at God. I had no reason to write down dates and names, so I didn’t. But I was (and am) certainly surprised at how many atheists seemed so angry at a God they claim doesn’t exist. It’s kinda mystifying. So basically what you are saying is hearsay, as I am a hardened atheist and I hang with more atheists than you have likely had hot dinners and have never heard an atheist say: I hate ‘God”. There mere concept is ridiculous. Atheists do not recognise your god or any other so why would they make a point of singling out your particular deity? Are you perhaps not confusing this statement with other christians who, like you, continually assert that atheists hate your god? It sounds like you are calling me a liar. I did not lie; I know what I experienced on several Google+ atheist communities for many months. And so that ends this conversation. 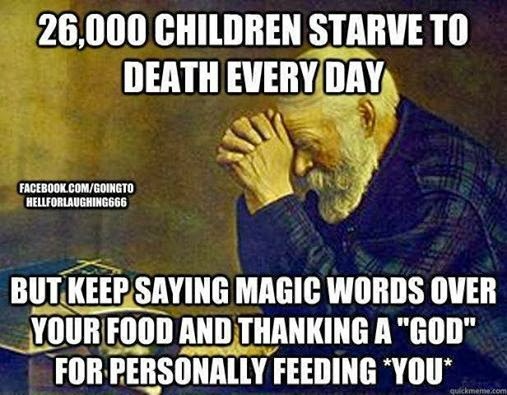 So how is that making fun of a deity instead of making fun of people who believe that their deity will help them find car keys and throw touchdowns in lieu of feeding starving children? I view that as the atheist seeing all of it as nonsense but saying Jesus must not care about the starving children and therefore must hate Jesus. This can be splved by the very humans with our available resources. With the food condition stated by the Canadian Agency, shows that with our resolved and commitment, the hinger in the world can be solved by proper strategies no guided by selfish pseudo-politics that run the many states. God is love. If His love is known and sets us free,the very false windows of our world are proprly focused, and the love guide the human mindsets, abd sound policies and commitment of resources will be by merit not regional or class or colour. The world would be a better place. God has given us clean minds and proper judging minds, but the world distorts our FOCUSES! The knowledge of our LOVING GOD IS THE ONLY SOLUTION TO THIS.